James II was the second son of Charles I and Henrietta Maria of France, was born October 15, 1633, and immediately created Duke of York. After the capture of Oxford by the parliamentary army, he escaped, and was conducted to his sister, the Princess of Orange. At that time he was 15 years of age. He soon after joined his mother at Paris, and, when he had reached his 20th year, served in the French army under Turenne, and subsequently entered the Spanish army in Flanders, under Don John of Austria and the Prince of Condé. At the Restoration he returned to England, and married secretly Anne Hyde, daughter of the Earl of Clarendon, by whom he had two daughters, who afterwards became queens of England, viz. Mary and Anne. In the Dutch war, he signalized himself as commander of the English fleet, and showed great skill and bravery. On the death of Charles II, in 1685, the Duke succeeded, under the title of James II., and, from the time of his ascending the throne, seems to have acted with a steady determination to render himself absolute, and to restore the Roman Catholic religion. After disgusting the great majority of his subjects, by attending mass with all the ensigns of royalty, he proceeded to levy the customs and excise without the authority of parliament. He even sent an agent to Rome, to pave the way for a solemn re-admission of England into the Catholic church, and received advice on the score of moderation from the Pope himself. A few months after his accession, severe laws having been passed against the Covenanters, against whom Graham of Claverhouse was sent, the invasion of Scotland took place under the Earl of Argyle, and the invasion of England under the Duke of Monmouth, both of which failed, and cost the lives of the leaders. By virtue of his assumed dispensing power, James rendered tests of no avail, and filled his army and council with Roman Catholics; while by a Declaration in favour of liberty of conscience, he also sought to gain the favour of the dissenters, who were, however too conscious of his ultimate object to be deluded by this show of liberality. The resistance to this illegal declaration led to the trial of the Seven Bishops, Archbishop Sancroft being one of them, and their acquittal was an occasion of great popular rejoicing. Thus the king proceeded by every direct and indirect attack to overthrow the established constitution; but these innovations, in regard both to the religion and government, gradually united opposing interests, and a large body of the nobility and gentry concurred in an invitation to the prince of Orange, who had been secretly preparing a fleet and an army for the invasion of the country. James, who was long kept in ignorance of these transactions, when informed of them by his minister at the Hague, was struck with terror and, immediately repealing all his obnoxious acts, he practised every method to gain popularity. All confidence was, however destroyed between the king and the people. William arrived with his fleet at Torbay Nov. 4, 1688; and being speedily joined by several men of high rank, his adherents multiplied while the army of James began to desert by entire regiments. Incapable of any vigorous resolution and finding his overtures of accommodation disregarded, James resolved to quit the country. He repaired to St. Germains, where be was received with great kindness and hospitality by Louis XIV. In the meantime the throne of Great Britain was declared to be abdicated; and William and his consort Mary (the daughter of James) were unanimously called to fill it conjointly. 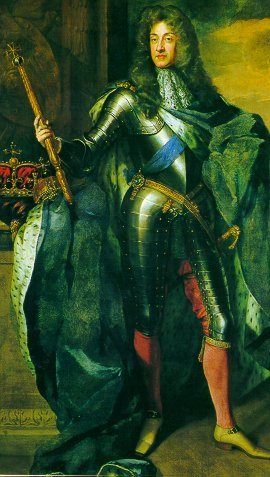 Assisted by Louis XIV, James was enabled, in March, 1689, to make an attempt for the recovery of Ireland. The battle of the Boyne, fought July, 1690, compelled him to return to France. All succeeding projects for his restoration proved equally abortive and he spent the last years of his life in acts of ascetic devotion, dying at St. Germains, Sept 16, 1701, aged 68. A portrait of James II, as Duke of York, by Wissing, is in the collection at Hampton Court.